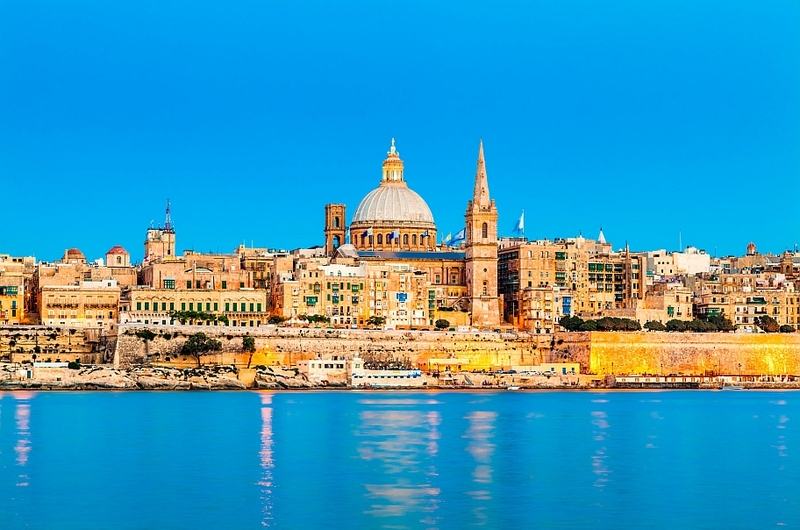 Once the cruise reaches the port, we recommend you to disembark as fast as possible, as this port is usually very busy. The boats of the shipping company will drop you to the old port (of Fira) and in this point the guide will be waiting for you, identified by the sign of the company. If our group will be over than 30 people we will take another boat to go to the port of Athinios. During this trip we will be able to see the magnificent cliffs with the various colours, that shows the reliefs of the petrified lava. In case of small groups of less than 30 people, we will take a funicular to go to Athinios without affecting the base itinerary of the excursion. Once in the new port we will take the bus and climb to the top of the cliffs, enjoying the panoramic view of the Caldera, a 3000 year old volcanic crater. We headed towards the most photographed village in Greece, Oia, a picturesque path, with cliffs on one side and sea on the other. 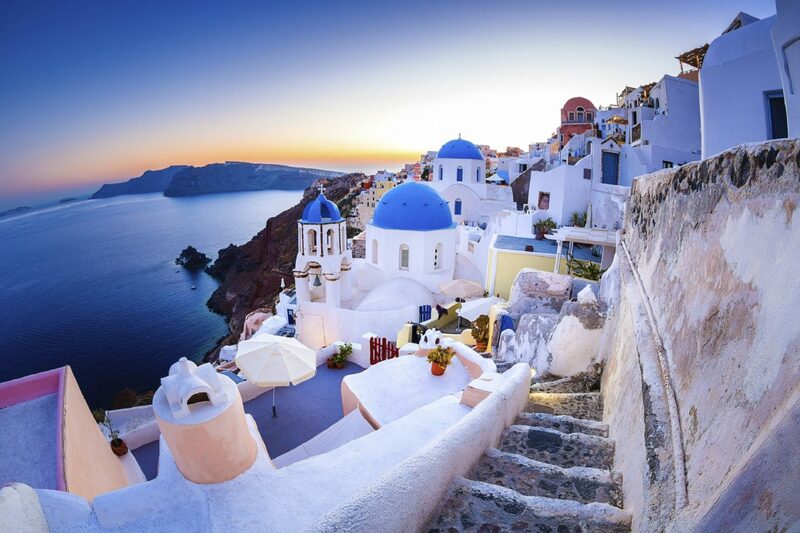 Located at the north end of the island, it offers the most beautiful view of Santorini, just below is the beach of Ammoudi and on the other side is the crater with its volcanic islands. 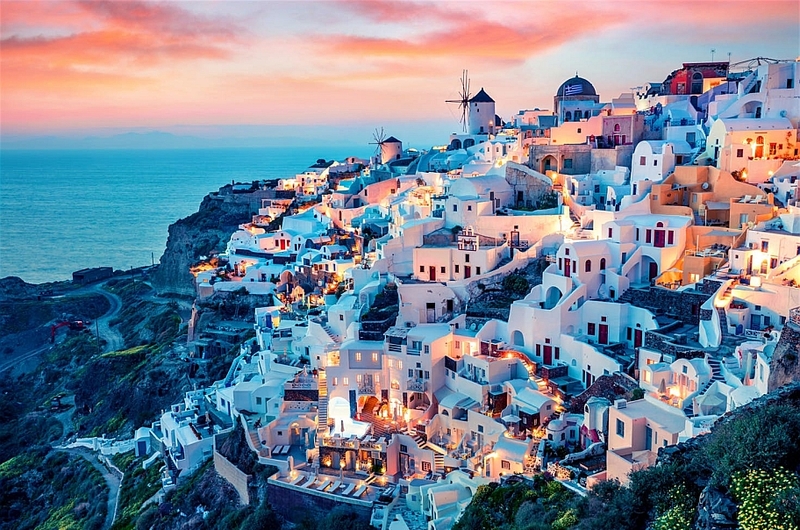 We will discover the typical architecture of Santorini, with its cave houses on the volcanic soil, the white walls, the blue domes that shine in the sun and its neoclassical past. 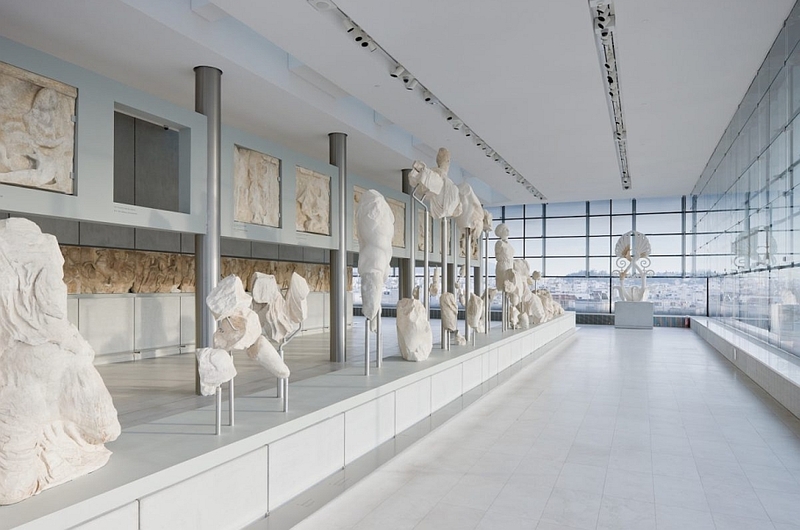 Oia houses today, a cultural center, art galleries of all kinds and works of Greek art. Many stores sell local crafts, jewelry and other items. It is there where we will have free time to discover the beauty of the town and walk through its streets. We continue towards Fira, the capital of the island and the most important town in the area. Fira is perched on the edge of a cliff 260 meters away. of height and offers a magnificent panorama on the submerged volcano. 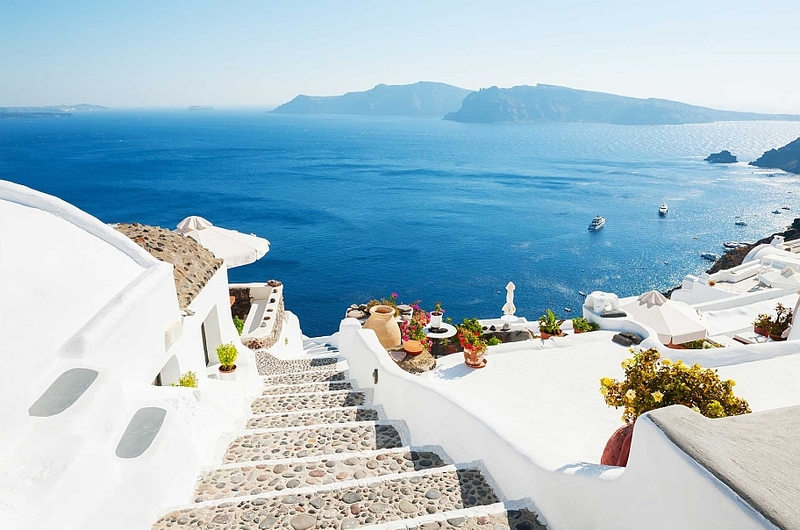 Its particularity is the houses painted in white, the churches with blue domes and the terraces bathed in the sun. We will pass through the Catholic quarter, under the arches of the convent of the Dominican Sisters, the oldest neighborhood of the town, Firostefani. After the tour, enjoy free time to explore this unique experience and walk through its commercial area. BOAT OR FUNICULAR FOR DISPLACEMENT (to be paid on site). ADULT RATE € 6.00, REDUCED RATE € 3.00 CHILDREN FROM 2 TO 9 YEARS OLD. This excursion is not recommended for people with reduced mobility traveling with wheelchairs or with baby carriages, since the terrain is irregular and the streets with narrow staircases. Please prepare the exact money for the supplements as the guide does not carry change. The boat archors at the Old Port or Fira Skala, the disembarkation will be by speedboats of the port and our guide will await you at the exit of the speedboats. In case of small groups less than 30 px, we will be transferred by a funicular after the speedboat without affecting our itinerary. It is very important to stay in this point as the port is old and there is no parking for buses. The cost of the speedboat or the funicular is 6€ paid on spot one way (the return is free). In this way we will avoid waiting in the queues to take the funicular. Free return: our company is not responsible for the prices so they may vary during the season and they are paid on spot.